I just got a new brush pen, here's one of my first pictures with it (reloaded to fix some color problems). 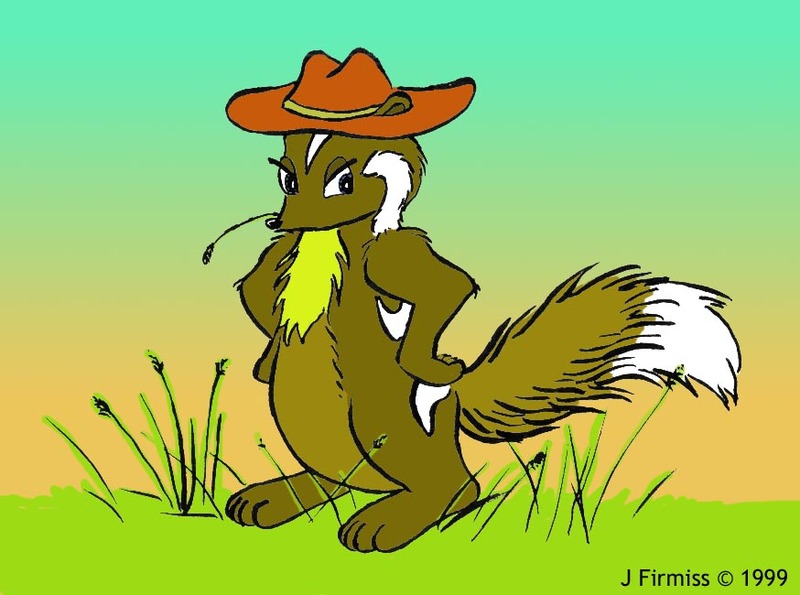 Here is AJ Skunk, the same character I based my first full-body costume on. 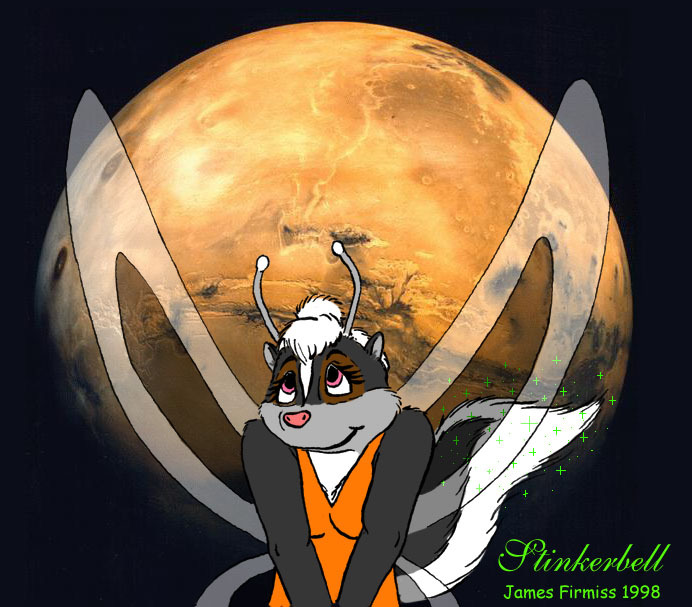 AJ, created when I was about 8 yrs old, is my very first furry character. 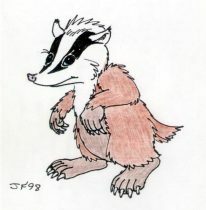 A picture I drew in a 1998 Christmas card to Craig F. It's an unnamed eurasian badger toon. I promised Craig I'd draw him a badger for a long time but never got around to it.. this 'quickie' drawing was a reminder that I still remembered his request. This was only 1 of 2 (out of a total of 16) card drawings I did in marker and colored pencil. Cortez Opossum. A character from my "Sectors" project. This pen & ink drawing is in my "'Possum-themed" sketchbook. A picture I drew in a 1998 Christmas card to Gary B. It's a mother doe similar to Bumbi's Mom (whaaa!). I planned on drawing a feline for Gary but the more I tried the worse they got so I gave up and just drew this. It turned out much better than I expected! Like most of my cards, this was done in ball-point pen. Foxx Fox is my second FurryMUCK character (I don't play him much these days). Drawn in 1992 this is one of my first color GIFs. I still think it turned out pretty well. I lost my own copy of this file and only recently recovered it. A comic strip I drew in a 1998 Christmas card to Jason Mc. If I can think of other "Futility of it All" strip ideas I might make this a series. Some errors in this strip: 1) The germs should have said 'Whee!' instead of 'Wee!'... One person thought they said 'Wee!' because the raccoon just went 'wee wee'... nope, they're just happy little partying germs. 2) The 'Wash your hands' sign was badly placed. -- Like most of my cards, this was done in ball-point pen. Another one of my GTAT sci-fi space critters. I drew the pencil sketch of this 'orycteropii' (aardvark recom) about a year ago. I recently tried out Al Mackey's photoshop tutorial for 'inking' and coloring. Not bad but I need more practice at it. It's been quite a while since I added a file. Iznbranal (brantii - canada goose recom) is the star of a sci-fi story written as a series of LiveJournal entires I've been working on. Set in the same 'universe' as the GTAT critters in my directory. Drawn at the LAFF 2004 NYE party where I forgot my good pens. 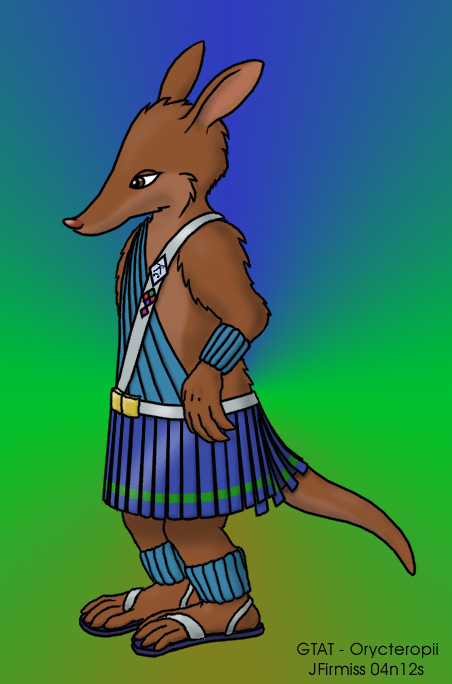 My first-ever drawing of my first FurryMUCK character, Neikrad (opossum). It was scribbled in a blue-lined notebook shortly before asking for the character. 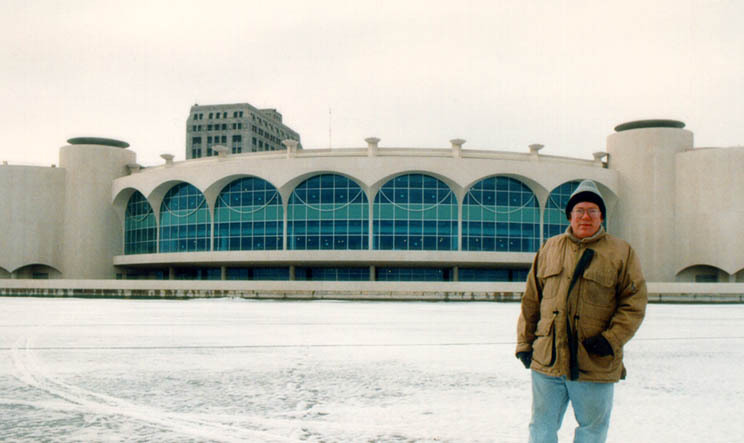 "91N20R" is the date of the drawing (shorthand for Thursday, June 20, 1991). 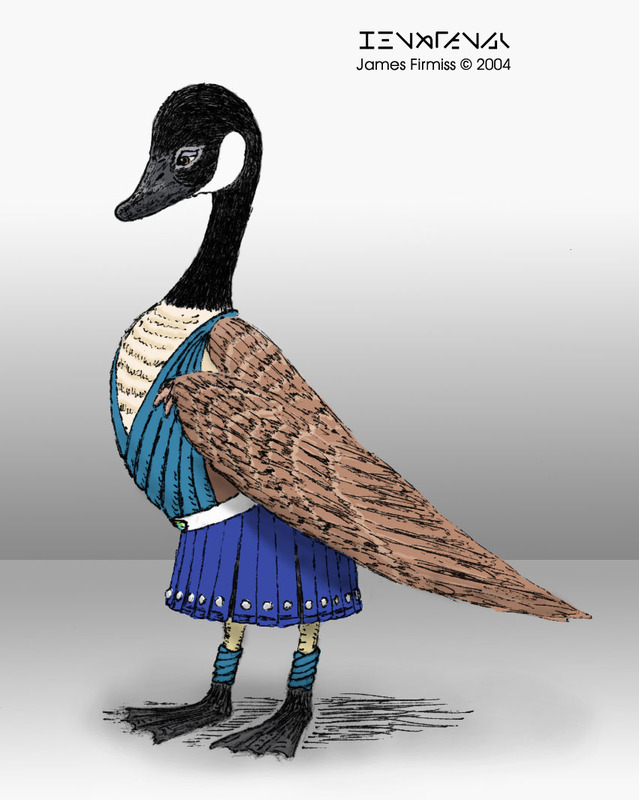 Photoshop color-tweaked to eliminate the blue lines. A quick drawing of Neikrad (opossum) sketched in a Christmas card to Peter "Frommer" Bednar which turned out pretty good despite being done in ball-point pen. Third attempt to color with Photoshop (I think I'm finally getting the hang of that program). Uh oh! Neikrad has been NAUGHTY. Now he's putting on an "I'm SUCH an innocent opossum... what could I POSSIBLY do wrong?" face. A sketch done in Steve Plunkett's sketchbook. My first prairie dog, Prairie Pearl is a character from a children's TV show, "ImagineLand". This was inked with a fine point felt tip marker because it was the only thing I had at the time. My first post for AltarSkunk... this idea is from STINK #21. 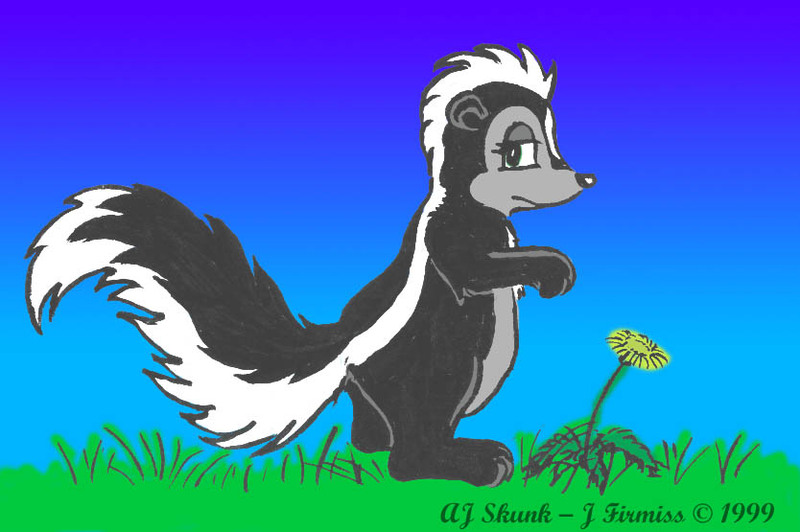 It's none other than Stinkerbell, the pixie skunk. I'll probably be posting a few more pictures of her eventually. A picture I drew in a 1998 Christmas card to Robert S. Here we see ALL the players on SECTORS (MUCK). 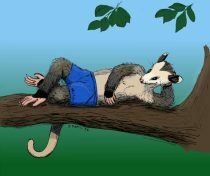 Featured are Cortez Opossum and Hoover the Owl. SECTORS is a teeny FB MUCK I run from time to time. As of this writing, it has a DB size of 15. -- Like most of my cards, this was done in ball-point pen. Skitch the Squirrel. One of my better drawings of this character for an old comic strip I was working on. I play him on FurryMUCK from time to time. 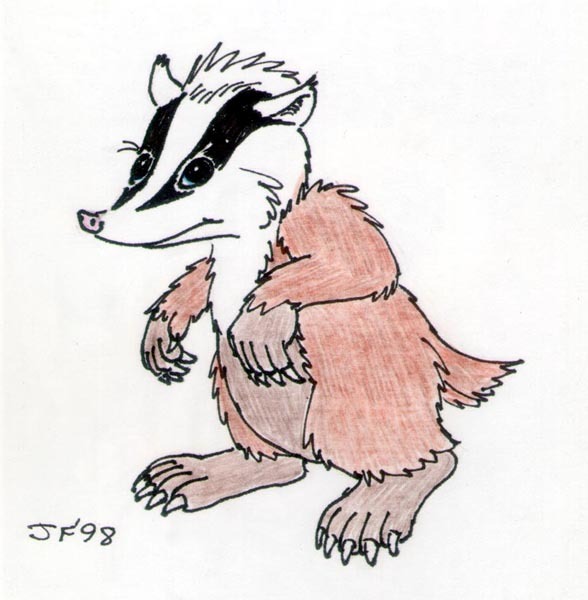 A picture I drew in a 1998 Christmas card to Ken S. Just an unnamed female skunk. 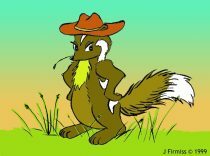 I'd probably draw skunks like this in my "Sectors" project. Like most of my cards, this was done in ball-point pen. Sphyxie is a friend's character originally from NarniaMUSH (she still shows up on FurryMUCK from time to time). I lost my own copy of this file and only recently recovered it. The original was traded for an animation cell. Eight hours to ink, this skunk is still one of my most detailed inking jobs. There aren't enough spotted skunks on this archive and many of the ones I've seen don't have a spotted skunk's natural markings. Anyway, I don't have a name for this guy, yet. I sent out part 1 of a furry sci-fi story to some friends... Here's some drawings based on that story: Svi'ak, a dasypii (armadillo recom) scientist from the retrotech planet Nisek-Vo. I sent out part 1 of a furry sci-fi story to some friends... Here's some drawings based on that story: Tohmik, a condylurii (star-nosed mole recom) scientist and on Svi'ak's research team. I sent out part 1 of a furry sci-fi story to some friends... Here's some drawings based on the currently unwritten part 2: Captain Ayers, erethizonii (canadian porcupine recom), commands the 'Ghaaunthonian Technical Assesment Team' (GTAT) space craft headed toward Nisek-Vo. I'm still deciding whether to make Captain Ayers male or female. I sent out part 1 of a furry sci-fi story to some friends... Here's some drawings based on the currently unwritten part 2: STATUS RED! SHIP IS ON FULL ALERT! A sudden lurch knocks an erminii (ermine recom) member of the GTAT crew out of his seat.